A Shepherd's Heart: Celebrating Advent! The last Sunday of November is officially the First Sunday of Advent which for many helps kick-off the Christmas Season of Celebration! It's been my observation that other than some decorations, many churches don't incorporate Christmas, Christmas focused messages or Advent anymore into their Christmas Celebration services leading up to Christmas Eve and Christmas Day. This is disappointing to say the least because Christmas and Easter (Resurrection Sunday) are two of the best times of year to share the love and light of our Savior Jesus through proclaiming all He did! Unfortunately many churches today miss the opportunity to share meaningful Christ focused messages during these times either in their quest to be "relevant" (which anything more "traditional" is seemingly thrown out) or it doesn't seem to fit into “their plan” just to name a few "reasons". Either way it's a missed opportunity to share Christ through two amazing views: #1 through His birth and #2 through is death and resurrection! Let me share from my heart to yours that I believe Advent can help provide a meaningful context to how we celebrate Christmas! Clearly, Advent observance isn't about some "meaningless ritual" rather it's about the remembrance of His birth - His miraculous entry into the world as a lowly babe! Do you know that Advent means "Coming" or "Arrival"? So, why wouldn't we focus on His coming/arrival during Christmas where we celebrate His Birthday?! I share all of this because I wholeheartedly believe that Advent can be a fantastic way for us to: #1 remember the significance of Christmas and #2 help focus our hearts, worship, celebration on the birth of Christ - the reason we celebrate CHRISTmas in the first place! With this in mind, if you happen to be someone who enjoys incorporating Advent into your Christmas Celebration or maybe you never have, I want to share the following link to the "Celebrating Advent Guide" I put together to share with you! This simple guide will help provide the basics to help you Celebrate Advent as a church, as an individual or if you have a family - celebrate it as a family! If your church doesn't incorporate anything directly related to the message of CHRISTmas let me encourage you to consider incorporating Advent into your own home as you count down the days to CHRISTmas! Even if you don't incorporate Advent into your Christmas Celebration this year - may this simple guide encourage you by pointing you all the more to Christ and help you prepare your heart to celebrate Him - His Coming (Advent) Birthday that we celebrate on December 25th! No matter what, may you help fight to Keep Christ in your CHRISTmas celebration! Have a wonderful Christmas! Feel free to share this post and guide with others! 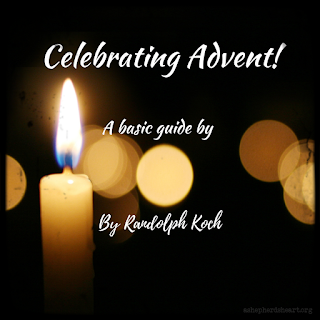 Lastly, If you decide to use this guide, I would love to hear from you (leave a comment here or e-Mail me directly) and would love to know how it helped walk you through Advent - pointing you to Christ! P.S. This guide is meant to be a simple tool/guide - a starting point - to guide you in your observance. As you'll see, there are suggested Scriptures and Prayers you can use or you can obviously do your own prayers. Again, this is just a tool to help guide you through your observance. You can use this word-for-word each year or again, create your own by adding scriptures from your own studies and of course your own prayers focused on the theme on each week of advent. No matter what, have fun, make it personal as you approach Him with a humble and thankful heart!